Fees for unplanned overdrafts are to be scrapped for the 20 million customers of Lloyds Banking Group, which includes the Halifax and Bank of Scotland. From November this year, any customer going over their overdraft limit will face no fees at all, Lloyds said. However, the bank may continue to block payments from the account until the overdraft is paid off. It follows criticism of high charges by consumer groups and the Competition and Markets Authority (CMA). The Financial Conduct Authority (FCA) is also expected to propose measures on overdraft fees within the next few weeks, as part of its inquiry into high-cost credit. Previously Lloyds customers taking out unauthorised overdrafts faced interest payments at an annual rate of 19.89%, a daily charge of up to £10, the monthly charge of £6, and up to £30 a day for returned (unpaid) items. These will all now be abolished. Fees for missed payments from basic bank accounts will also disappear. Lloyds said that it expected to make less money as a result of the changes, although it said fewer people now use an unauthorised facility than used to be the case. Barclays has already abolished unauthorised lending. Since June 2014, customers cannot exceed their overdraft limit, unless they obtain permission for emergency lending. As well as scrapping charges for unplanned overdrafts, Lloyds is also simplifying fees for planned overdrafts, making it cheaper for many customers to borrow. Those with overdrafts of less than £500 are likely to pay less, while those borrowing more than £1000 are likely to see higher charges. Anyone who takes out an authorised overdraft with Lloyds Banking Group - in other words the bank has agreed to it - is currently charged a £6 monthly fee, on top of interest at 19.89% a year. While the £6 fee will be dropped, the interest charge will rise sharply, to 68.4% on an annual basis. Lloyds said that amounts to 1p a day for every £7 borrowed. As a result nine out of 10 customers will either be better off, or see no difference, it said. However, the changes will not make Lloyds the cheapest lender on the market. Andrew Hagger, personal finance expert with Moneycomms, said there were at least eight banks providing lower cost overdrafts. 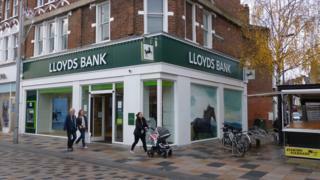 The move by Lloyds to abolish unauthorised borrowing fees was welcomed by consumer groups. "Lloyds' decision to do away with these fees is a positive step, and its proposed simpler pricing will benefit many of its customers," said Peter Vicary-Smith, Which? chief executive. "However, not everyone will be better off, so it's critical that Lloyds supports customers to help them avoid high charges and to reduce their level of debt." The FCA should encourage other banks to follow suit, he added. As part of its inquiry into current accounts, the CMA ruled last year that banks should introduce a maximum monthly charge - set by each bank - by the end of September 2017. Lloyds is due to introduce a maximum monthly charge of £95 for unauthorised overdrafts in August, although this will be superseded by the changes in November. RBS and NatWest will introduce a £80 maximum on 24 July. HSBC is to remove interest charges on most unarranged overdrafts, but will still charge a £5 daily fee, up to a maximum of £80 a month. Are you a Lloyds customer? How will you be affected by the changes? Share your views and experiences by emailing haveyoursay@bbc.co.uk.